Age Limit : Not exceeding 30 years as on the closing date of applications. MBA 1st Class with 70% marks aggregate or above; or equivalent from a UGC recognized University or AICTE recognized institution. a. Good knowledge and hands-on experience of: Research Tools and Aids such as MS Office Tools, Macros, Merge Tools, Google Forms, Google Scripts, Google Scholar etc. Research Databases & Search Techniques. Survey Instrument Design and web-enablement. Data Analysis, Pattern & Trend Identification, Visualization of Data Insights etc. b. At least four years of full-time experience in the above areas in academic institutions of repute such as IIMs, IITs, IISc Bangalore, NITIE Mumbai, IISERs etc. or similarly acclaimed research institutions/establishments in India/abroad • Good oral and written communication skills. a. Formal training in / exposure to quantitative methods, tools and techniques. Between Rs.50,000/- and Rs.70,000/- p.m. based on Institute’s norms, commensurate with qualifications; experience, last pay drawn and performance in the selection process. I. Nature of Appointment: Currently on fixed-tenure contract for a period of three years. May be regularized in future in a suitable scale of 7th CPC and absorbed in the Institute at an appropriate level, subject to: requirements of the Institute at that juncture; GOI guidelines; availability of positions; extant rules and regulations of the Institute; conduct and performance of the incumbent; approval of the competent authority, etc. II. Reporting: Currently, one position to the Dean (Academics & Research) and the other, to the Director. 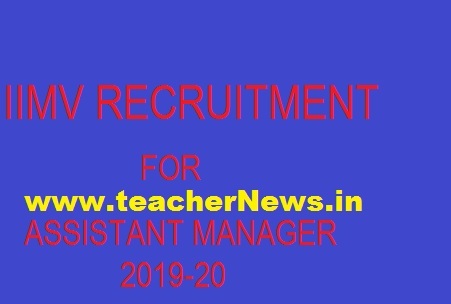 (a) The number of vacancies can be increased or decreased at the discretion of the Institute. (b) The Institute reserves the right to consider the candidature of persons who may not have applied. (c) Mere fulfilment of qualifications and experience does not entitle a candidate to be shortlisted. The Institute reserves the right to restrict the candidates to be called for theselection process to a reasonable number, based on relevant criteria, higher than the minimum prescribed. (d) Qualifications acquired must be duly recognized in law. (e) Experience would be reckoned as on the closing date of applications. (f) The duties and responsibilities and/or the reporting relationship of the incumbent may change, at the discretion of the competent authority. (g) The place of work is the Institute’s campus. It is presently located in Andhra University, Visakhapatnam, Andhra Pradesh. The Institute is likely to move to its permanent campus located in Gambheeram Village in Anandapuram Mandal, in about three years. The permanent campus is about 20 Km.s from the present (temporary/transit) campus. (h) The Institute reserves the right to transfer the incumbent to any Campus/Centre that it may open at any other location in India, in future. (i) Candidates are advised to visit the website of IIM Visakhapatnam (www.iimv.ac.in/careers) regularly for updates. Amendments, corrigenda (if any), will be placed on the Institute website only. (j) The Institute reserves the right not to fill up any/all the position(s). (k) The Institute will communicate only with short-listed candidates. (l) Short-listed candidates employed in a Government (Central or State) Department, Organization or Autonomous Institution; or, Public-Sector Undertaking (Central or State) MUST produce a No Objection Certificate (NOC) at the time of interview. Otherwise they will not be interviewed. (m) No correspondence from applicants shall be entertained during the recruitment process. (n) Canvassing in any form will be a disqualification. (o) The Institute requires the selected candidates to join at the very earliest. (p) Candidates who have been interviewed by the Institute for any position in the past oneyear NEED NOT apply. (q) Interested candidates are invited to apply using the prescribed format only, available on the (www.iimv.ac.in/careers) page. Applications should be complete in all respects. Additional sheets as needed may be used and referenced suitably. All information furnished MUST be based on supporting documentation. Incomplete/incorrect applications are liable to be rejected. (r) At the time of submitting the application, copies of certificates/supporting documentation NEED NOT be attached. Such proof would be sought ONLY from the short-listed candidates. (b) The closing date for receipt of applications by the Institute is 13 May 2019 (Monday), 1700 Hrs. (c) In all matters of recruitment and selection, the interpretation and decision of the Screening and Recruitment Committees of the Institute shall be final and binding. (d) Selection process may include one or more of the following: (i) Test on Quantitative Aptitude & Data Interpretation & Logical Reasoning; Verbal & Reading Comprehension;(ii) Computer-based problem-solving exercise; (iii) Interview. (e) Candidates may be considered for a post lower than that applied for, if they are otherwise found suitable. (f) Disputes (if any) shall be subject to the jurisdiction of civil courts of the city of Visakhapatnam, Andhra Pradesh.